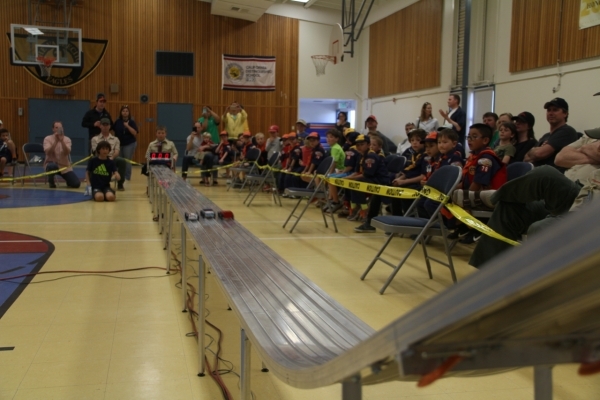 The Pinewood Derby is one of the highlights of the Cub Scout program. This is a wonderful opportunity to spend time with your Scout building something together. Stay focused on fun, and let your Scout do as much as is appropriate for their age. There are no Derby college scholarships! 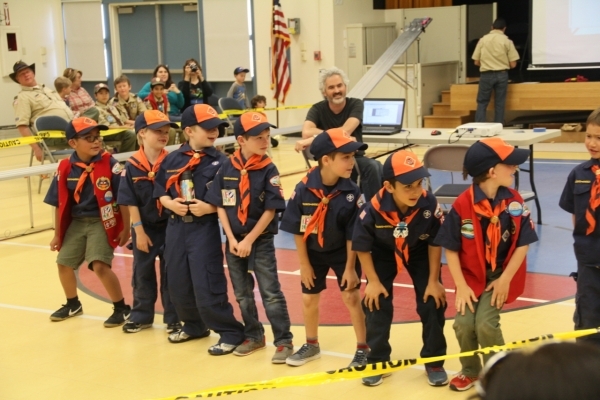 We do strictly enforce the rules out of fairness to all our Scouts, so please ask questions well in advance if you have them, and please remember that this is a fun- focused race for children. It’s easy to get sucked in to the vortex of Derby websites and lose your Scout’s interest. If your Scout’s car doesn’t win a race or design award, entering it in the County Fair display is almost sure to net a first or second place ribbon for design there. Adult and siblings are encouraged to join in on the fun and race in their own heats. Marin Council has OKed the use of other pre-cut cars if you need to go that route, BUT the car must be BSA licensed (Revell is a licensed brand per the seal on the box) and must meet all the same requirements as the kit for axle slots, wheel type and placement, wood type, etc. It is your responsibility to make sure those requirements are met. Cars may not be reused from a prior year, and must be made by the Scout and partner. Pre-made or pre-painted cars (such as those found on Ebay) are forbidden. Marin Council holds an annual workshop day at Camp Tamarancho where Scouts can purchase kits and accessories, design their cars and have them cut at the wood shop by adult volunteers. Pack 76 also holds workshops to help Scouts with car building and decorating (but not necessarily cutting). The balance of the designing happens at home with an adult helper. We hold our Derby in the decorated Vallecito gym amidst music, snacks and a lot of excitement. All Scouts race in several heats by Den and winners race in the Pack championship for speed. We also award several design categories including most original, fastest looking, best Scout spirit (patriotic or BSA themed), silliest, best paint job and many more. 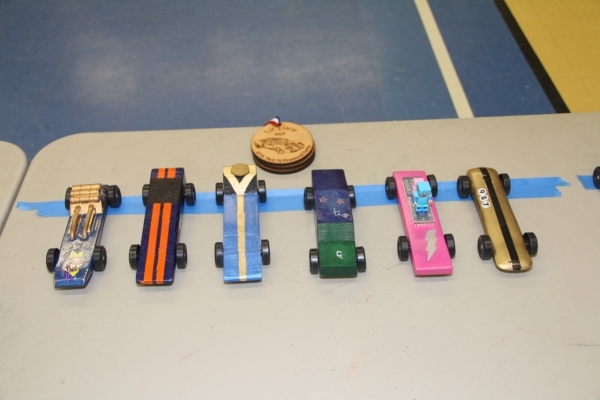 First place speed winners in each Den move on to the county wide race, which takes place at the Marin County Fair. All Scouts may also enter their cars for the Fair’s design contest as well (with copious ribbons for these entries). The Friday or Saturday before the PWD race, we will hold a MANDATORY car ‘check in’ event where each car will be weighed and inspected to ensure it is qualified to race. If your car is overweight or has other issues, you will need to fix it and come back. Better to underestimate weight by a little than go over and have to correct. The check in volunteers are working long hours, so please respect their time and effort. – It must not weigh more than 5 ounces. – The axle grooves cannot be moved (re-drilled) in the block of wood. – The original axles and wheels that came with the kit must be used, unless you choose to replace with the same wheels that are of a different color. Cars must have been made for this year’s race. Width shall not exceed 2-3/4”, length shall not exceed 7”, and weight shall not exceed 5 ounces (measured to nearest 1/10 of an ounce). Width between wheels must be at least 1-3/4”. Clearance between the track and underside of car should be no less than 3/8″. Only official BSA wheels and axles must be used. The size and shape of wheels may not be altered. No modification of the kit axle is allowed, except axles may be polished and burrs sanded. The axle slots on the wooden block must be used and cannot be moved or altered. No paint or clear coat is allowed on any area of kit wheels. No hub caps are allowed on wheels. Only dry lubricant (Teflon, graphite) may be used on wheels. No liquids. The car shall not ride on any type of spring and must be free-wheeling. Washers, bearings, and bushings are prohibited. Decorative details, paint, stickers, etc., may be used as long as they do not conflict with other rules. The nose of the car must be at least ½ inch wide in order to rest on the starting peg. Wheels may not protrude beyond the front or rear of the car. The running surface must remain flat and all four wheels must be in contact with the track. Any type of weight can be used as long as it does not interfere with the clearance or the dimensions. Weights must be securely attached and stationary. Have a great time building!! We are here for questions when you have them.